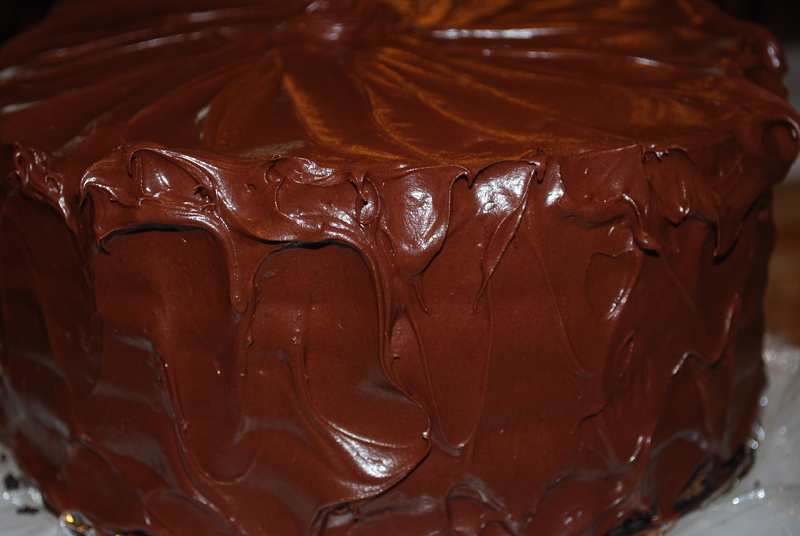 Rich, dark, moist with an intense chocolate flavor, this cake is always popular. It is a large enough cake to serve 12-16 people and is a good choice to serve as part of a dessert buffet. I have given the recipe to many people and often take it to friend’s homes as my contribution to a dinner party. Preheat oven to 350°. 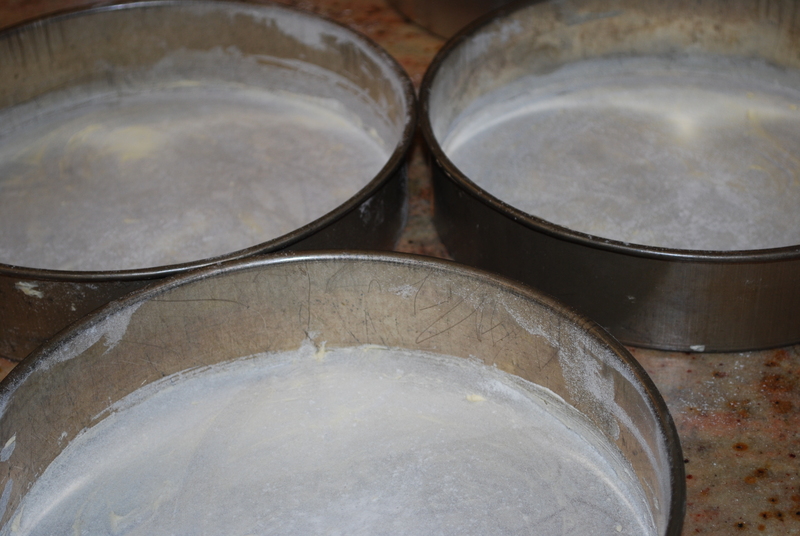 Grease three 9 inch round cake pans or 2 ten inch pans. Line the pans with parchment paper cut to measure. 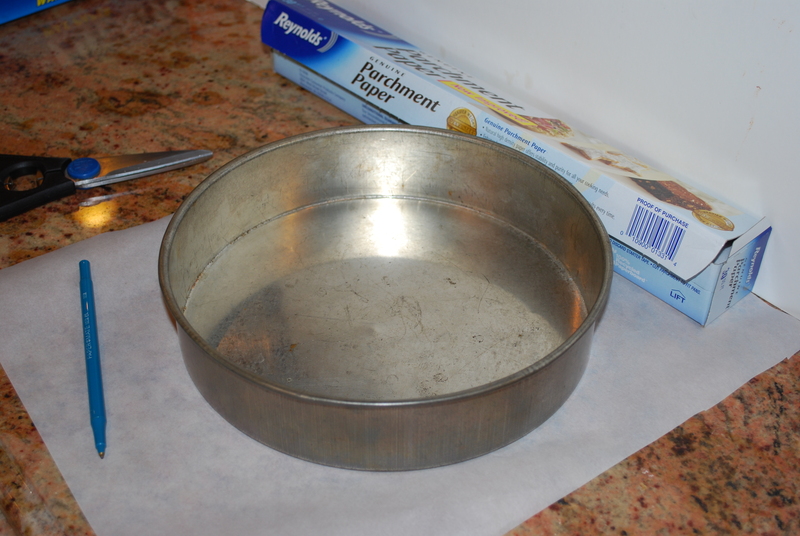 To measure trace the base of the cake pan onto the parchment with a pencil and cut out the circles. Grease the parchment paper as well. 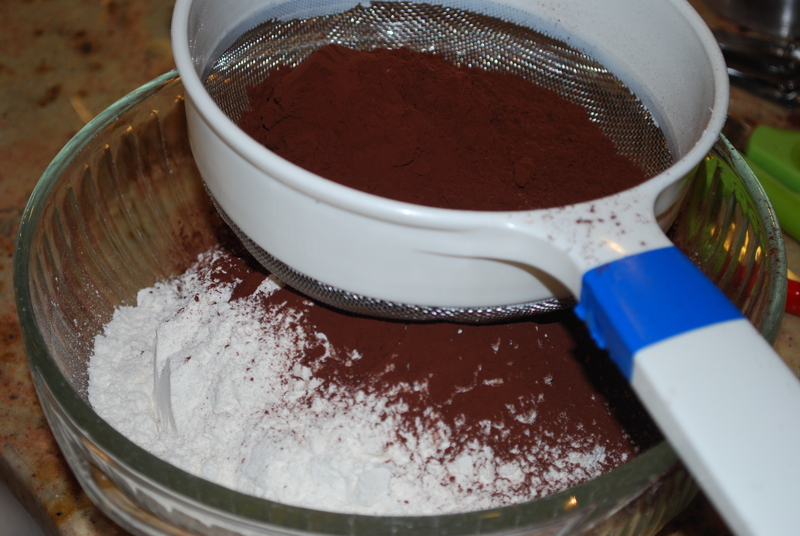 Dust the pans with 1 tablespoon of flour, then shake out the excess. Only grease the bottoms, not the sides of the pans. Sift the dry ingredients together into a bowl and set aside. 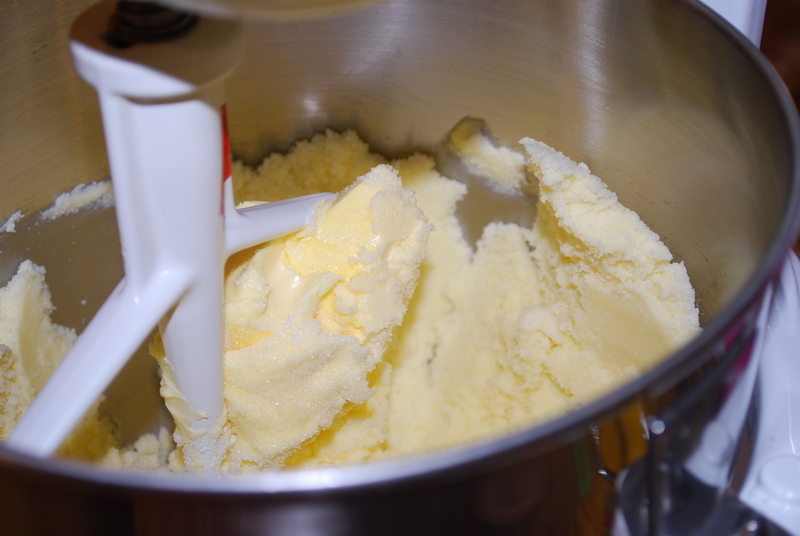 In another bowl, cream the butter and sugar until fluffy, about 2-3 minutes on medium low. Crack the eggs in a glass bowl and check them for shells or blood spots. Add the eggs to the creamed butter and sugar and mix for an additional 3-5 minutes until pale yellow in color and thick. Add the vanilla and blend. Add the dry ingredients in three additions, alternating with the water and blending in between each addition until just combined. 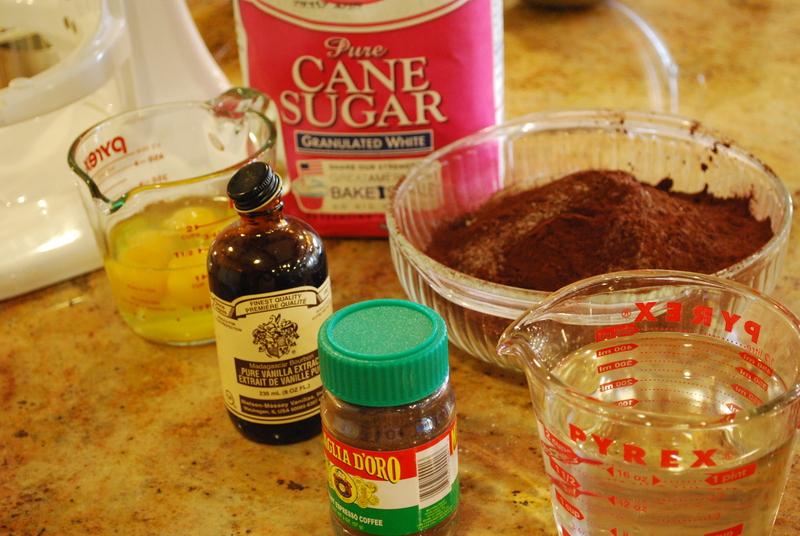 End with the last addition of the dry ingredients and mix until just blended. Over mixing cake batter, makes for a tough cake. 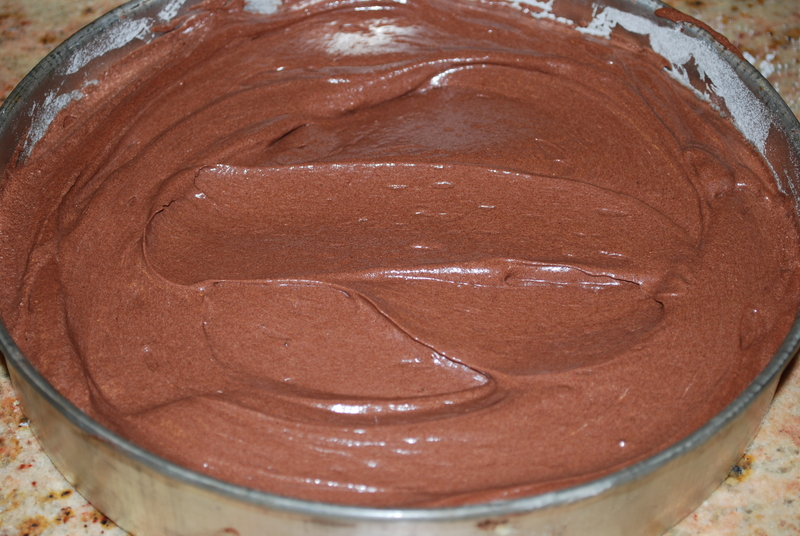 Divide the batter equally among the 3 prepared cake pans. Bake on a rack in the center of the oven until just done about 30-35 minutes. Check for doneness with a toothpick. Poke the toothpick in the center of the cake layer and when you pull it out it should be dry with no moist or wet crumbs clinging to it. Remove the cake layers from the oven and place on cooling racks for 10 minutes. Run a sharp knife around the edge of each pan and invert pans on to another cooling rack. Carefully remove pan and remove the parchment paper (it peels off in one piece). When the cake layers are completely cool you can proceed. Use the cake layers immediately or wrap and freeze them individually until the day you need them. I place them on foil wrapped cardboard rounds for support. They sell the round cardboard at supply stores like Surfas. 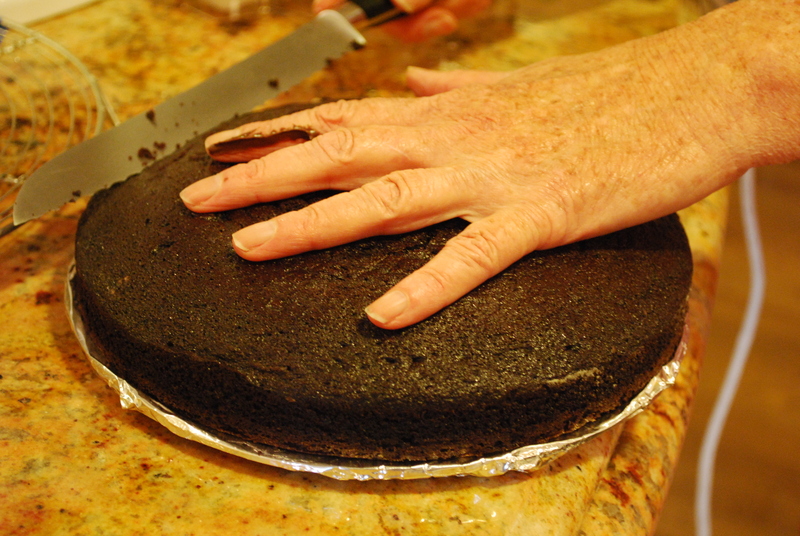 If you are going to use the cake immediately, place the first layer on your lined serving platter. Trim the top of the layer you are going to start with so the top is flat. Trimming cake layers flat with a long serrated knife allows the cake to be even when you assemble it. 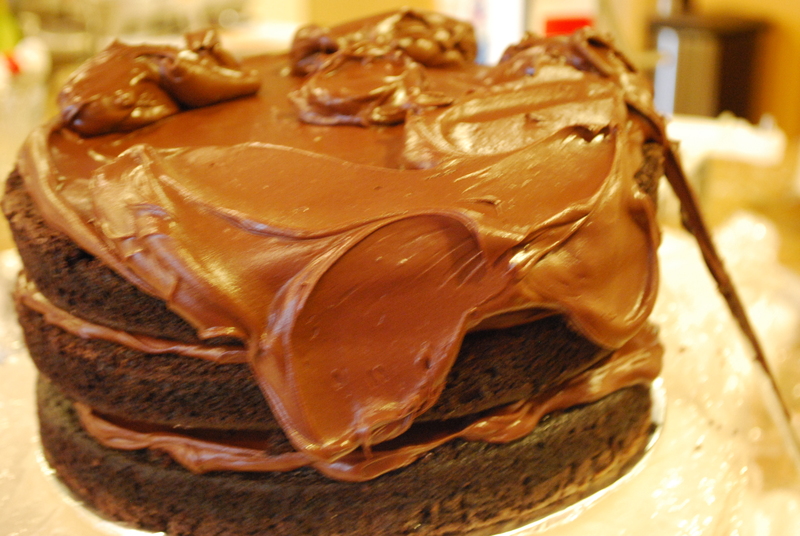 The frosting recipe below makes enough to frost and layer the cake. The chef gets to eat all the cake trimmings. 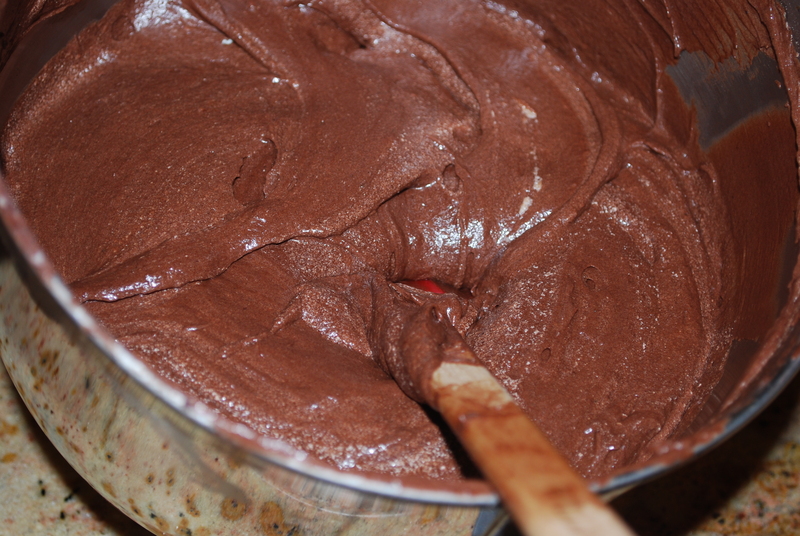 Using an icing spatula, scoop about ½ cup of the frosting onto the first layer. Spread evenly to the edges. 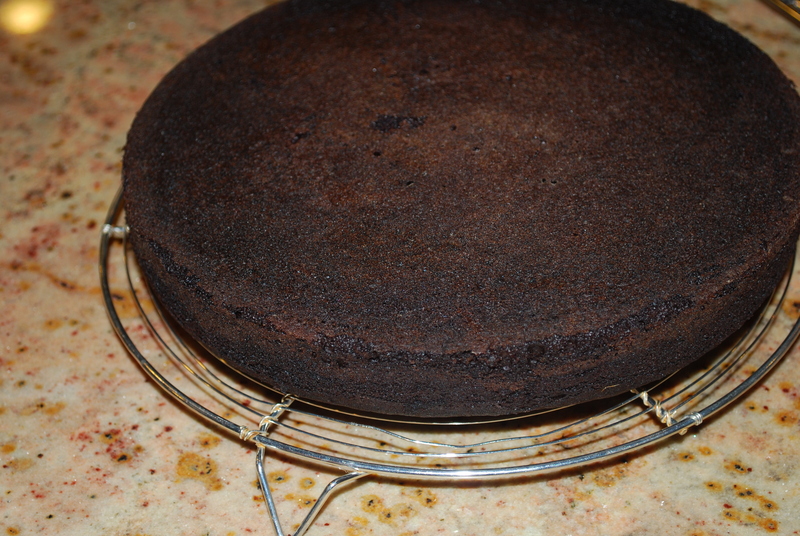 Place the second trimmed cake layer on top. Repeat the same thing with the frosting. 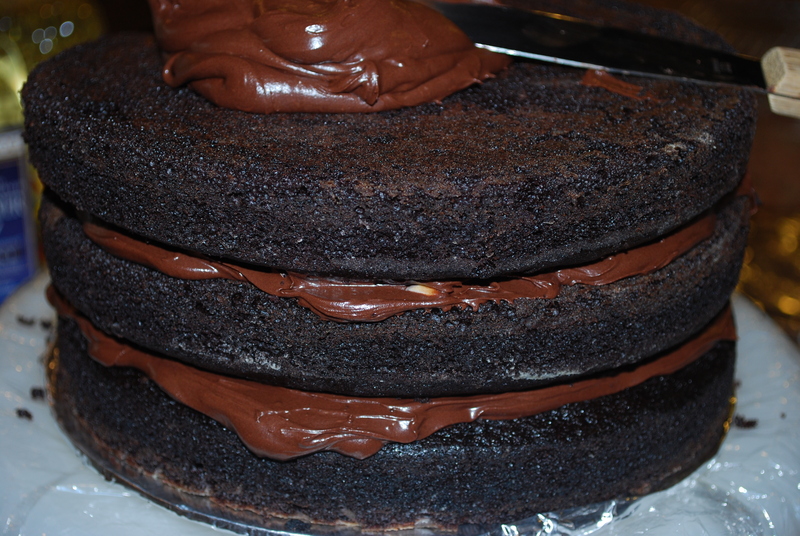 Place the third layer on top and frost the top. 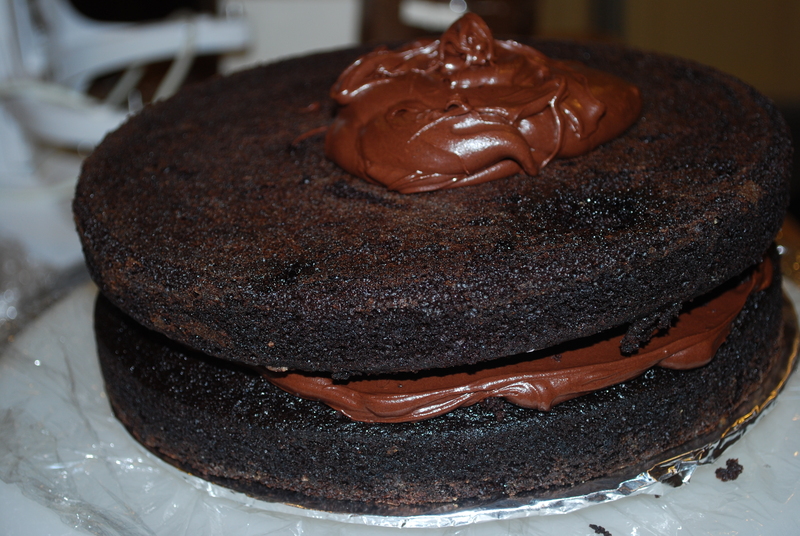 Use the remaining frosting to cover the sides of the cake. Decorate by swirling the spatula or using a cake comb. 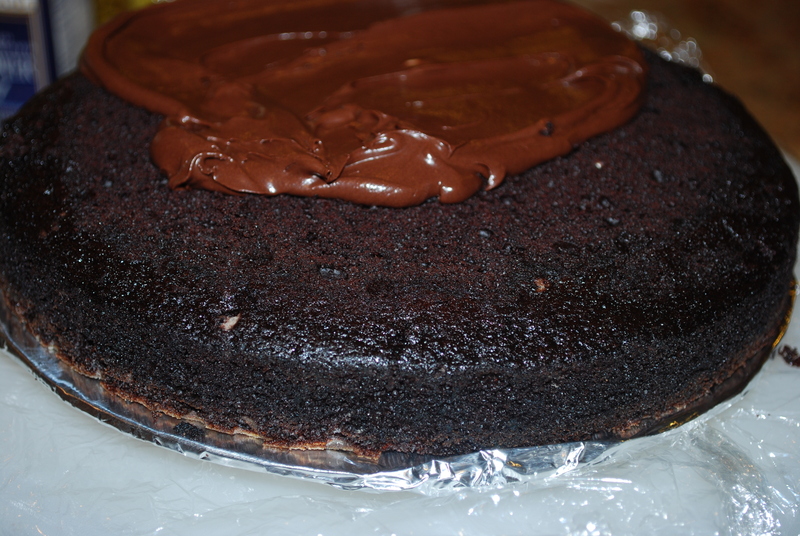 You can decorate the cake with chocolate espresso beans, candied violets, chocolate curls, or just leave it plain. Store the cake in a cake keeper in the refrigerator. This makes a big cake, great for birthdays, holidays, and tastes great made non dairy with unsalted margarine. Combine all the ingredients in a food processor. Process mixture until it is smooth and silky. Stop one time to scrape down the bowl and incorporate everything. I recently sent this in to the Cake Collection at 1.family.friendly.food. I will posting apple pie in two weeks. Your blog sounds yummy.